I watched Kung Fury last night and I won’t lie. I didn’t like it. It’s only 30 minutes long so I watched it again this morning and I actually liked it better this time. I think that I was taking it too seriously. 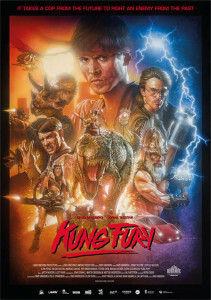 Kung Fury is a crowdfunded short film written, directed, and starring David Sandberg. It’s an intentionally bad homage to 80’s cop flicks. Initially, I think that I didn’t like the fact that it’s just completely insane and nonsensical and I had just watched a very serious movie earlier. Sandberg plays a cop who was struck by lightning and bitten by a cobra which somehow gives him the ability to use the deadly art of Kung Fury. Eventually, with the help of a computer hacker, aptly named Hackerman, and a Nintendo Power Glove, he hacks time to go back and fight Kung-Fu Hitler. It’s completely nutty. I didn’t even mention the dinosaurs who shoots lasers out of their eyes. The style feels very heavily influenced by Far Cry 3: Blood Dragon. If you want a short cheesy 80’s experience then give it a try. It’s available from the glorious price of FREE on the Kung Fury website or the Laser Unicorns Youtube channel. The effects are pretty good. There is also a companion video game as well as a soundtrack featuring David Hasselhoff (included below for your viewing pleasure). He really went all out. ”Initially, I think that I didn’t like the fact that it’s just completely insane and nonsensical” – maybe sometimes it’s better to read at least a little what exactly you’re going to watch? It’s an incredible parody on the 80-s, man!